There are over 100 species of Yarrow but only a half dozen are common in commerce. The most popular are the colorful varieties of A. millefolium. These yarrows spread out from a center crown by popping up new growth along roots that travel just below the surface of the soil. Under most garden circumstances, they make lazy, sprawling garden companions for tall shrubs. It is the tender loving care of extra water and fertilizer that causes this lax habit. In forests and on roadsides, these plants, deprived of summer moisture, remain small and sturdy and, quite frankly, ugly. Like many plants bred for color, as the hybrids naturalize and disperse seed they eventually return to the color of origin. For the humble yarrow, this is a dirty white. 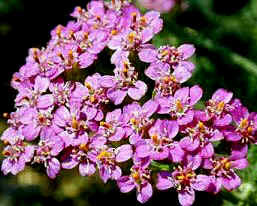 It is this yarrow that has many names, many legends and traditional medicinal uses. Thus, we offer the White Yarrow for those who wish to use it to staunch bleeding or reduce external inflammation. Tuck a few in and around the garden for those times nippers mistake fingers for plant stems. We also offer a mix of colors that offer a surprise in every pot. This Colorado Yarrow seed ranges in color from yellow to red. It has good strong color that does not wash out in summer sun. Place these Yarrows about a foot apart, and if the balance between wet and dry can be found, they will provide sturdy upright flower stems from about June until September. In areas with scorching summer days, Yarrow can be planted in afternoon or filtered shade, but attention to water is even more important to keep them from splaying out. If desired, support can be provided to guide the flower stems up. Fertilizer should not be needed in normal healthy soil and can increase the sloppy habit. And, while the ph preference for Yarrow is on the acid side of the scale (around 6.5), it does perfectly fine in moderate alkaline soils. Although small ferny leaves do progress up the flower stem, it is essentially only the flower stems that rise off the ground. Most of the leaves cover the ground, providing shade for the creeping stems. All stems should be removed at ground level when harvesting or after bloom. This is especially important if the yarrow is planted as a lawn cover. It is not necessary to divide yarrows as long as they have room to roam. If they become cramped in their space, they can be lifted in spring and divided. Gophers usually accomplish this for us. As a matter of fact, between the gophers, bunnies and squirrels, we have started to grow most of our Yarrows in containers. They make great pot plants, but, like mint, they quickly use up soil. When they start to fill up the pot, they will need fresh potting soil with organic fertilizer and a larger pot. Clumps can also be reduced in size by division and replanted in fresh soil in the same size pot. Flower heads of A. millefolium can be cut for fresh use and last 3 to 5 days in the vase. Composed of many tiny flowers, each half-dome-shaped head bursts forth with color radiating outward from the center. It can take several days for a flower head to fully open. The best time for cutting is when it is completely and before it starts to pale. To avoid excess rot and odor the leaves should be stripped off before the flower stem is placed in water. Changing the water daily helps to extend the vase life. Unfortunately, these blooms lose all color when dried. The growth habit of Achillea fillipendulina is tidier than A. millefolium. The gray, feathery leaves rise up to about two feet and stay in a clump rather than crawling about. The bloom time is considerably shorter for this species, so it is particularly nice that the foliage is well behaved and attractive. After bloom, the plant can be cut to the ground. It will regrow foliage but will not not bloom again (except for the rebellious odd bloom) until the next spring. "I am sorry that I am not familiar enough with the use of Yarrow in conjuring up the devil to explain how it is done. I never need such charms or spells to summon the devil. All it takes is a few idle thoughts and a moment of inattention, and the old boy is right at my elbow suggesting something we can do or something we can leave undone." Still a great book after all these years!